Part-exchanges and de-fleetings are feeding through thick and fast and the lumpy ones are sensible money. 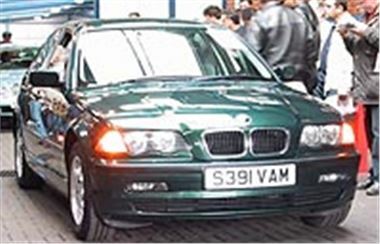 The 98S 318iSE in the photo had 102,000 miles under its wheels and sold for £8,000. It was the oldest in a selection from Vodafone and a similar 99T with 83,000 bid to £8,300, while a 2000V 316i 1.9SE with 96,000 miles sold for £8,700. The less miles, the more you pay, and a 2000W 318iSE with 55k bid to a stronger £11,000. Surprisingly, a much lower mileage 2000W 323iSE with 38k only bid to a provisional £13,550. Rover 75s are now making regular appearances and start at around £7,000 for an 81k 99V 2.0 V6 Club. A base spec 2000V 1.8 Comfort with 51k sold for £7,700 and a top spec 99V 2.0 Connoisseur auto in a nice light metallic blue with 76k sold for £7,900. Standard fleet fodder is going for buttons. How about a three year old 99S Rover 620Sli with a lowish 59k that sold for £2,825? Or a 98S Mondeo V6 with 56k for £3,700? Or, indeed, a 98S Daewoo Leganza 2.0SX with just 19k that bid to a mere £2,575? That’s the same sort of money you have to pay for a ten year old BMW 320i with 100,000 miles. The one Daewoo model that hasn’t taken a severe knock is the Matiz as 99T and 99V reg SEs and SE+ with 20 – 30k are still holding up at £3,100 to £3,300. If you don’t think the E46 318iSEat the top was cheap, then how about this: a 110,000 mile facelift Omega 2.5 V6 Elite auto on the same 98S reg sold for exactly half at £4,000. Expect more big engined bargains over the next few months as the new CO2 based BIK company car tax begins to bite. BIG 4X4 AUCTION NEXT TUESDAY: Brightwells will be holding its huge fortnightly sale of 4x4s at Leominster Market, A49 Leominster Bypass from 11.00am on Tuesday 2nd April. Entries kick off with a 1981 88 inch LandRover 2.5 diesel and go all the way to 2001 Freelanders and Discoverys. Other makes and models are also very well represented. For more information, visit www.brightwells.com or telephone: 01568 611325.